Score one for me! 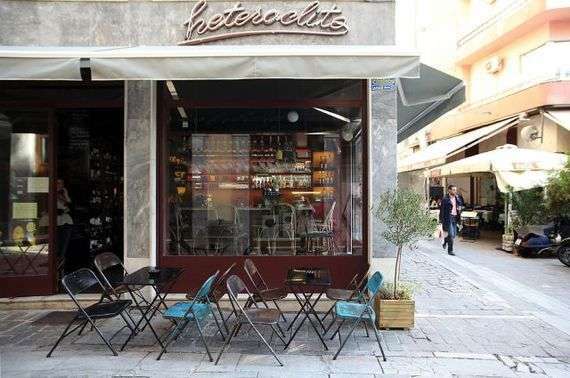 The first spot on his “eat and drink our way through Athens” list was a bar that I was not only familiar with, it’s also one of my favorite places to grab a drink in Athens. I do still have a lot of exploring to do before I can claim to know the city the way Vasili does. But, I think this means that I’m off to a good start! I love Heteroclito for several reasons. One, the bar serves nothing but wines that are produced in Greece. They also serve a limited menu of cheeses, cold cuts, and pitas, which are all from Greek producers. It’s a great place to experience the wines of a country that is often overlooked when it comes to oenology (By the way, oenology is a Greek word. So let this stand as proof that the roots of Greek wines go much deeper than the lowly Retsina). The other thing that struck me about Heteroclito from the first time I went there was the style. The bar is small with an understated charm. The dim lights, marble counter, and neon signs, are reminiscent of 1950’s Paris. I never made the connection until the day I went there with Vasili. It turns out that the bar’s owner, Madeline, is half Greek and half French! When a Frenchman decides to open a wine bar, serving nothing but Greek wines, I think it says it all.